Deck styles and sizes are as varied as the homes they’re connected to, so meticulous planning is the first step in any successful outdoor construction project. And when it comes to planning, the difference between a ‘nice’ deck and an ‘oh wow’ deck is often found in its special details. Fine-design can be incorporated into deck building, literally, from top-to-bottom. Beginning at the deck’s floor surface, to the rails and stairs, to skirting and deck covers (roof, pergola or gazebo), skillful contractors can boost features in either subtle or bold ways. There are different techniques to accomplish this, but a favorite ‘trick-of-the trade’ for integrating affordable or high-end deck detail is with contour and patterning. So today, let’s examine how ‘shape’ and ‘pattern’ influence the visual impact of deck design. 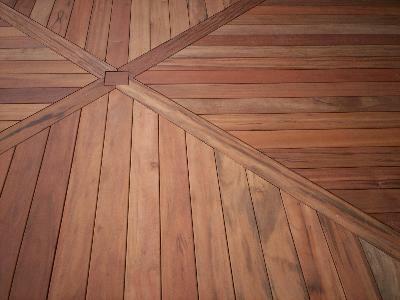 Shape – Options for a deck’s shape include geometric designs with assorted angles, lines and/or curves. This aspect of the architecture really sets the tone for overall style – contemporary to conventional. Popular among St. Louis homeowners is adding a slightly raised hexagonal space for dining. It’s an affordable ‘focal point’ that’s functional too. Spheres, bows and arches create gorgeous rounded edges for a deck design; however, these features involve upcharges for additional workmanship and materials. But for many folks, the dazzling visual impact is well worth the extra cost. As a less expensive alternative, small angles can be designed and built which present a similar look to actual curves. 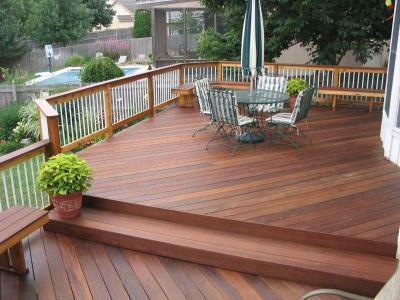 Pattern – Decking boards and the pattern they creates also contribute to the style of your deck. Infuse plenty of flair into an otherwise simple deck with floor board patterns including diagonal planking with a center parting board; diamond, herringbone, basket weave or other inlays; deck board color change for peripheral edging. Shape – Just like deck floors, railing and stairs can be built with clear-cut angles and unmistakable curves but there are other ideas for adding understated ‘shape’ in the design too. Balusters and post caps are a design-tactic used to bring loads of dimension to a backyard deck for a nominal price. These components are available in an assortment of colors, materials and styles too. For example baroque balusters add arches, pyramid or lantern post caps add angular lines whereas rounded caps add curves. Pattern – Rails create style with decorative infill or glass, centerpiece balusters, cable, tubes or metal. 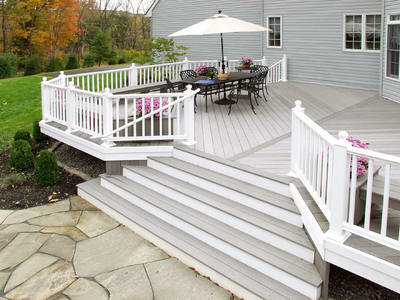 Deck stairs ‘sizzle’ when designed with striking angles or a two-tone color scheme. Seriously, the custom possibilities for unique shapes or patterns with rails and stairs are nearly limitless. A word of caution. Don’t create confusion by going overboard with design elements. Keep it tasteful. 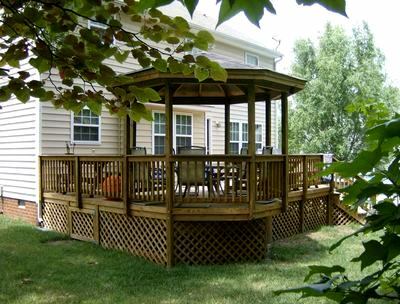 Customers frequently want a roof, shade pergola or even a gazebo built over portions of a deck. And if the deck is raised or elevated, skirting provides a polished look with a nice finishing touch. In this category, shape and pattern intermingle with oodles of opportunity for extraordinary detail. Roofs can be hip, gable or shed and ceilings may be flat or vaulted. Pergolas, too, are versatile deck covers and can be designed as a fan-shaped triangle, as a square or rectangle, multi-sided, arched, bowed and curved. Gazebos commonly are six-sided; however, they exude a ’rounded’ look too. Our recent blog post, “Getting the look you want with skirting” explains the ins and outs of deck skirts — including shape and pattern, complete with pictures. Be sure to check it out! When it comes to designing a deck that’s both functional and beautiful, seemingly ‘small’ details such as pattern and shape, can ‘make or break’ a backyard deck project. Significant visual impact, at different prices, can be achieved with focal-point floor patterns, railing and stairs, post caps, balusters, deck covers and skirts. Successful design details require careful planning and should complement the lines of your existing house and landscaping. It’s best to use simple patterns for small spaces to avoid an outdoor space that appears ‘busy’ or ‘confusing’; however, several design details, if done right, will turn a plain deck into a masterpiece. 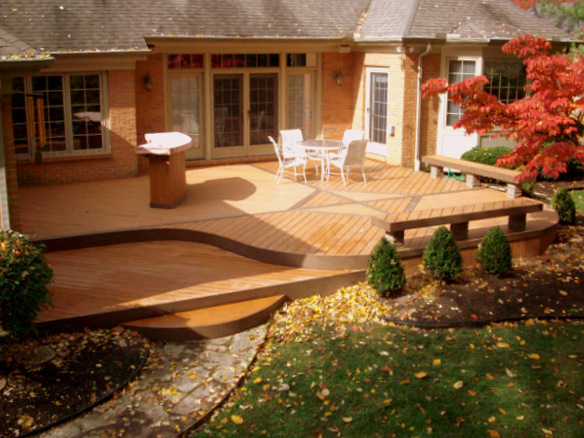 And top-notch contractors like Archadeck are pros at designing/building decks and other outdoor spaces. From comprehensive large-scale plans down to the fine details and project nuances, Archadeck can help. If you live in St. Louis, Missouri or surrounding counties, please consider Archadeck. 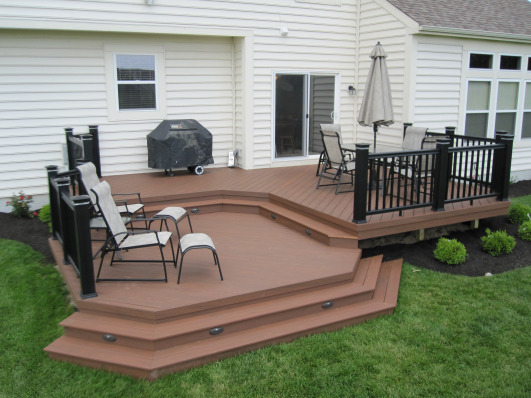 You can give us a call (636.227.0800) or visit our website (west-county.archadeck.com) to see hundreds of our projects throughout the region. We’re locally owned and operated with offices based in St. Louis West County. Do you live outside of Greater St. Louis? No problem… just visit archadeck.com for a location nearest you. And if you’re not familiar with the Archadeck brand, be sure to read ‘About Us’ on this blog for a few highlights.